The red Khezu is a subspecies of the normal Khezu. You meet this monster for the first time in a Level 8 Quest. As its name suggests, the subspecies is distinguished by its red color from the normal Khezu. In addition, it is a lot bigger than the ordinary Khezu. The biggest weakness of Khezus is the water element, which is why their weapons should take this element. 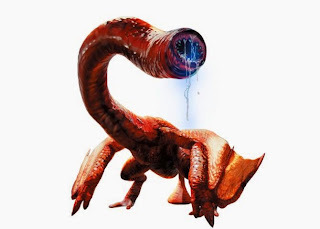 So like his blue cousin, the red Khezu also uses Thunder element attacks, and can you also still paralyze. Thus armor is recommended with good Thunder protection if you are fighting against the red Khezu. Destructible body parts when Khezu are his face, his wings, as well as his body. Even the red Khezu uses the same attacks as the ordinary Khezu. Only these, as in subspecies so, stronger and add more damage to you. In addition, the red Khezu has more health than the ordinary relatives. The red Khezu will perform well-known attacks, such as the tail spin or he will grab with its long neck for you. Most of the time but he will perform a variety of thunder attacks. So it is, for example, a thunder-barrier erected around when you stand near him. He can recharge his body but also with electricity and then jumps on you to. Even the red Khezu is very often shoot with thunder balls to you. But not three pieces in succession, but three at once the move to the left, right and straight. A new attack of red Khezu is a thunder balls, he shoots to the ground. This now remains lying on the ground a few seconds until it explodes. All these thunder attacks add you in addition to normal damage and thunder damage to the lowers your status. So sews with enough zero berries for healing. The Pink Rathian is a subspecies of the common Rathian. You meet this monster in the offline mode for the first time in an 8-star Quest. So as with most sub-species of the biggest difference is again only in the colors of the monster. The Rathian subspecies has namely no green but pink color. However, the pink Rathian has the same element and weaknesses, as the normal Rathian. This would be the dragon-and-thunder-element, which is why recommended weapons with this element in the fight. The subspecies can again breathe fire and bring you so with fire element damage to burn. In addition, the pink Rathian has a poisonous sting at the tail end with which it can poison you. A defense should therefore have a good fire-protection and do not forget to pack a few antidotes. Destructible body parts in pink Rathian are her head, both wings, the tail and her back. The tail you can disconnect with bladed weapons. Among the well-known attacks, some new movement patterns were added. The tank of pink Rathian is also more stable than that of an ordinary Rathian whereby your weapons a higher degree of severity need to not bounce. In the battle the pink Rathian is a lot nastier, because it is much faster and more aggressive than the ordinary Rathian and they can consecutively perform many attacks in a very short time. 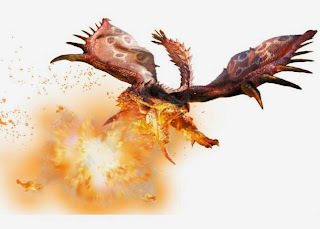 The pink Rathian is much more often in the air and leads from there made their Salto, inflicting you an enormous amount of damage and can poison you. They usually makes the Salto after a second time so be careful. In addition, from their mouth come flames when she bites to you which will bring you to burn. If the pink Rathian executes its somersault from the ground, she pulls her tail no longer grade upwards, but rotates diagonally. This is particularly nasty because the beginners the first time to fight the monster, do not expect this change in Salto. Otherwise, there is no further change in the attacks of pink Rathian. You can spit as already known fireballs, but also a huge flame shock to you, causing a lot of fire damage.